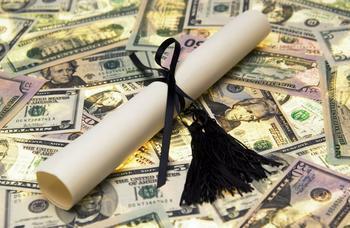 It's a question that sparks a lot of debate as college tuition costs rise. Is a college education worth the huge price tag? A new Bankrate survey finds most respondents think it is but, curiously, a large number also say college should be free for anyone who wants to attend. In other words, it's worth the cost, but people don't think there should be a cost. Drilling down through the data, you'll also find an age disparity in the breakdown. Generally, the survey found the older the graduate, the most likely he or she to say college was worth the investment. Younger Millennials are the least likely to think it was. When you add up all the costs, Washington, DC area financial advisor Christopher Krell says the price of a college education has gone up 500% since 1986, making the rise in health care costs seem modest by comparison. And for a student accepted at one of the nation's elite private universities, the four-year cost can easily surpass $200,000. But Krell sides with the majority in the Bankrate survey. A college education, he says, is worth the investment. “Investment in education is important and many employers have made a college degree essential to getting hired,” Krell said. A solution, he says, is for parents and grandparents to plan well in advance and take advantage of some of the savings programs available that can help pay college costs. Krell also says parents should understand that paying for college is often like buying a car. There is a negotiating process, with incentives in the form of aid that can sometimes greatly reduce the “sticker price” of college. On paper, they are. But if a private school wants a particular student on its campus, the cost can often magically fall. Krell says the average discount for students attending a private college or university is about 53%, which is an all-time high. The bottom line is this: earning a college degree is still a smart move. Taking on huge amounts of debt to get it isn't.